News | Ready, Steady, Science! Here are a few of the things that I have coming up in December. I do plenty other stuff but these are things open to the public. Friday 02/12/16- I will be comedying at the Comedy Bin at the TBird, Finsbury Park, London. Sat 03/12/16- I will be doing a series of talks at the Science Museum, London as part of their Night Owls event. Night Owls enables young adults who have an Autism Spectrum Condition to come along and enjoy the Museum free from the hustle and bustle. Tuesday 06/12/16- I will be doing DED talks at the Harrison, London, talking about Hippocrates. Sunday 11/12/16- I’m gigging at the Tooting Comedy Lounge with great folk like Chris Coltrane and Nicola Houghton. Tuesday 13/12/16- I’m performing at Book Show Off alongside Helen Keen, Helen Pilcher and other great folk. Wednesday 14/12/16- I’m doing Punk Science at the Angel with Angela Barnes and other great comics. Wednesday 14/12/16- Another episode of my podcast Level Up Human will be out. I am doing my best to update my website a bit more. So here are some of the public things I am doing this month. This is what I have on this month. I have a new article out- Why Do More Men Than Women Commit Suicide? Saturday 01/10/16- I will be at Centre for Life in Newcastle doing my Ugly Animal Roadshow. Sunday 02/10/16- Still in Newcastle- talking about dissecting large animals to support the wonderful Bodyworks: Animals Inside Out exhibition at the Centre for Life. Tuesday 04/10/16- I’m giving my Why We Die Lecture at the Linnean Society. Wednesday 05/10/16- A new episode of Level Up Human is out. This one was recorded at Wilderness festival and my guests were Lindsay Sharman, Maia Elliot and Jamie Upton. I have my first childrens TV show kicking off this month. To celebrate space week RTEjr have released 5 episodes on their app. The series is starting on RTEjr this coming Saturday October 8th at 5.10pm. Monday 31/10/16- I’m comedying at the Good Ship with Ben Van Der Velde, Paul Duncan McGarity, Katie Pritchard, Will Seaward and Andrew O’Neil. I never update this anywhere near enough so the below is a very far from exhaustive list of things I have coming up in the next month. Wednesday 07/09/16- A new episode of my podcast Level Up Human comes out. Thursday 08/09/16- The RI- Science of Star Trek. I will be joining Jamie Gallagher and friends to debate the celebrate the 50th anniversary of this mush loved series and have a natter about astrobiology. Friday 09/09/16- I will be doing a guest spot at Robin Ince’s evening of comedy at the National Space Centre in Leicester. Wednesday 14/09/16- I will be doing my Why We Die talk in London through Art Necro. Saturday 17/09/16- I will be on Weekend on the BBC World Service. 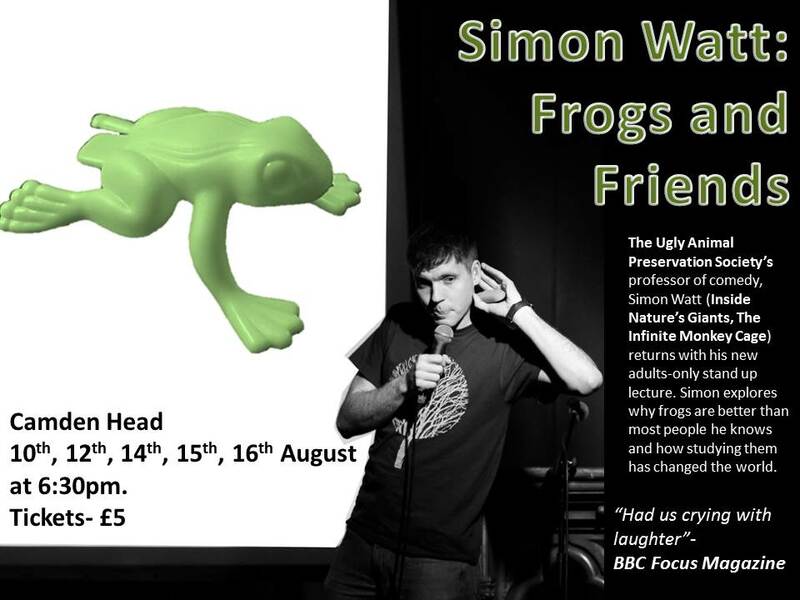 Saturday 17/09/16- I will be doing the Ugly Animal Roadshow at Brighton Science Festival. Monday 19/09/16- I will be chairing a debate in Sheffield about “good” bacteria called Fear the Unseen. Wed 21/09/16- A new episode of my podcast Level Up Human comes out. This episode was recorded live at Glastonbury and I am joined by Hugh Dennis, Alice Roberts and Marcus Du Sautoy. Friday 23/09/16- I will be MCing Bright Club comedy night in Grantham at the Gravity Fields Festival. Saturday 24/09/16- I will be performing the Ugly Animal Roadshow in Grantham at the Gravity Fields Festival. Sunday 25/09/16- I will be performing my history of medicine panto, Dr Death and the MediEvil Medicine Show in Grantham at the Gravity Fields Festival. Friday 30/09/16- I will be recording another 2 episodes of my podcast Level Up Human in St Andrews as part of Explorathon. Saturday 01/10/16- I will be performing the Ugly Animal Roadshow in Newcastle at LIFE. Sunday 02/10/16- I will be talking about dissecting huge creatures in Newcastle at LIFE. A whole host of Ugly Animal gigs coming up! There are a whole host of Ugly Animal gigs coming up including at Cheltenham Science Festival, Rap Battles and at the Camden Fringe. 18/07/15- The Ugly Animal Rap Battle at the New Cross Inn. Tickets available soon. 11/08/15- The Ugly Animal Preservation Society, New Material Night will be at The Book Club, London. 22/09/15- The Ugly Animal Preservation Society, New Material Night will be at The Book Club, London. 13/10/15- The Ugly Animal Preservation Society, New Material Night will be at The Book Club, London. I have a fair few public events coming up including a lot of festivals and other events. Really can’t wait! 13-14/04/15- The Ugly Animal Road Show (family show) and Dr Death and the Medi-Evil Medicine Show will be at the Edinburgh Science Festival. 21/04/15- I will be performing at Science Show Off with Neil Denny, Steve Cross, Helen Scales, Helen Keen, Dan Schrieber and more at the Star of Kings, London. 22/04/15- I will be judging the FameLab UK Final at the Bloomsbury theatre. 01/05/15- My book The “Ugly Animals- We Can’t All be Pandas” will be released in the USA on this day. It is already out in the UK. 14/05/15- My book The “Ugly Animals- We Can’t All be Pandas” will be released in Bulgaria on this day. It is already out in the UK. 28/05/15- We will be recording an episode of our new podcast series “Level Up Human” at University College London. 30/05/15- The Ugly Animal Road Show (family show) will be at May Festival, Aberdeen and hosting the thinking persons comedy club, Bright Club Aberdeen. 04/06/15- I will be performing my Cracking the Code lecture at the Cheltenham Science Festival. 07/06/15- I will be talking at Penguins, Narwhals and Other Really Cool Animals at the Cheltenham Science Festival with Lucy Cooke and Rory Wilson.